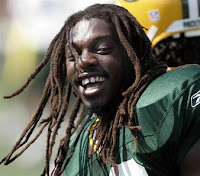 Packers Resign Bigby ~ The Bucky Channel - The World of Sports from Wisconsin's Perspective. Packers make another key resigning today, as they sign safety Atari Bigby to a one year tender. Bigby's base salary for the year will be $445,000. He'll also have the opportunity to draw from the NFL Player Pool, which gives money to players who have low base salaries yet play a lot throughout the year. Bigby was an exclusive rights free agent, which means he wasn't able to qualify for unrestricted or restricted free agency. Ryan Grant and Ruvell Martin are two exclusive rights free agents that are still unsigned, while Tory Humphrey and John Kuhn were in the similiar situation but also resigned. These are basically housekeeping moves by the Packers, and all five guys made big contributions to the team last year. "All five guys made big contributions to the team last year," including Tory Humphrey? Did he hold a clipboard? Or do laundry? Get donuts? Not much he could do from the injured list. That said, he could be a contributor THIS year if healthy.